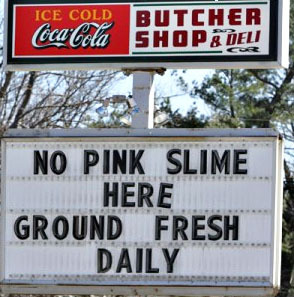 Will Banning Pink Slime Destroy the Planet? If those numbers are correct — and, fair warning, they do come straight from the beef industry — then a ban on pink slime would, potentially, require the slaughter of another 1.5 million cows to meet the nation’s beef needs. And, because cows are a major source of heat-trapping methane, that can have a serious global-warming impact. How much impact, exactly? The average cow emits the equivalent of about four tons of carbon dioxide per year. To put that in perspective, the average car emits about five tons per year. So, in the worst case, a total ban on pink slime would be the equivalent of adding 1.2 million cars to the road, from a climate perspective. Wait a second. I don’t really have an axe to grind here, since pink slime doesn’t disgust me much despite everyone’s best efforts to activate my gag reflex over the past few weeks. It’s a mere drop in the vast ocean of crap that I shovel into my body daily. Still, pink slime only cuts down on carbon if it would otherwise get thown out. But it doesn’t, does it? If it doesn’t get added to your Big Mac, it will just go back to being used in pet food and cooking oil. I assume that’s less lucrative for the cattle industry — though I’m not sure why since cat food costs about as much per ounce as ground beef — but the effect on global warming is zero. One way or another, the stuff is all going to get used. Or am I off base on this somehow? UPDATE: Generally speaking, pink slime probably represents a higher value use of the raw ingredients than, say, oil or cat food. And if the industry can squeeze more value out of its cows, that will probably increase demand for cows. I can buy that. However, it’s a second order effect and depends very sensitively on actual industry practices and consumer preferences. More data needed! However, if I had to guess, I’d say that the effect of pink slime on overall cow production is fairly small, not the 1.5 million that the industry estimates via simple arithmetic. According to this paper, the price elasticity of beef is -0.61. So a 1% increase in the price of beef produces a .61% decrease in the demand for beef. According to this report, pink slime reduces the price of ground beef by about 3 cents per pound. Roughly speaking, that’s a decrease of 1%. An average cow produces about 500 pounds of edible meat. Harvesting pink slime increases that by about 10-12 pounds or so. Let’s call it 11 pounds. Total beef consumption in the U.S. amounts to about 34 million cows per year, or 17 billion pounds of beef. Banning pink slime raises the price of beef 1% and therefore reduces demand by .61%. So demand goes down by 100 million pounds. With pink slime gone, 34 million cows each produce eleven pounds less of edible beef. That amounts to 370 million pounds. To meet demand, we need to increase production by 270 million pounds. That comes to 540,000 cows. If this is close to right, it means that banning pink slime really does have an effect, but it’s maybe a third of what the industry claims. Feel free to contest this conclusion in comments. As always, there are a bunch of additional second and third-order effects, so modeling this with any real precision is very, very hard.